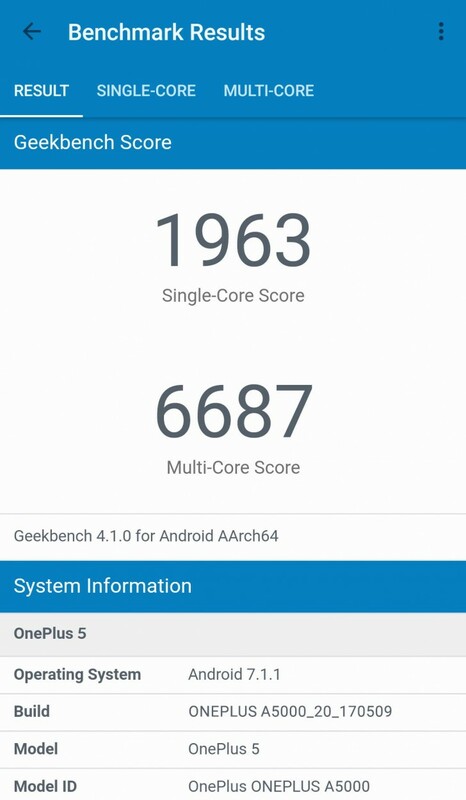 We received an exclusive screenshot from a very credible source, revealing the OnePlus 5 benchmark scorecard on GeekBench. The results show an impressive score of 1963 (single-core) and the massive 6687 score (multi-core), topping the GeekBench 4 list. The Galaxy S8 and the Xperia XZ Premium are two of the more popular devices with the same chipset, but their scores are a bit lower than the OnePlus 5's. Samsung's flagship scored1929 in single-core and 6084 in multi-core , while Sony’s brightest star got 1943 in single-core and just 5824 in multi-core. From the screenshot, we also see that the 5 will come with Android 7.1.1 Nougat base for OnePlus’ in-house Oxygen OS. Now while we have very good reason to trust our source that the screenshot is indeed the real deal, there's no way for us to know what kind of software the smartphone was running. The pre-production units might have slightly different scores compared to the final ones, but given that the numbers are broadly in line with the other Snapdragon 835 devices, variations probably won't be great. Really which is your country where both phones are priced same? Actually, OnePlus OS is quite optimized... Maybe it's because it's near stock android with better GPU algorithms. Gaming performance is amazing as it's the only smartphone at the moment that can play PSP Emulation without lags.